I’m running for the coast again this weekend as the summer begins to come to a close, accepting an invitation for a bird’s eye view of the Air Force Thunderbirds and the Army Golden Knights as they headline the 10th Atlantic City Airshow, Thunder Over The Boardwalk. Last year the event drew about 800,000 people to the city, and I’ll be watching from the cabanas of the newest casino, the Revel. We talked last month about how Atlantic City has been trying to revamp itself, and the opening of Revel earlier this year has been a big part of that process (as well as the hiring of the Super Bowl team to design the new lightshow). 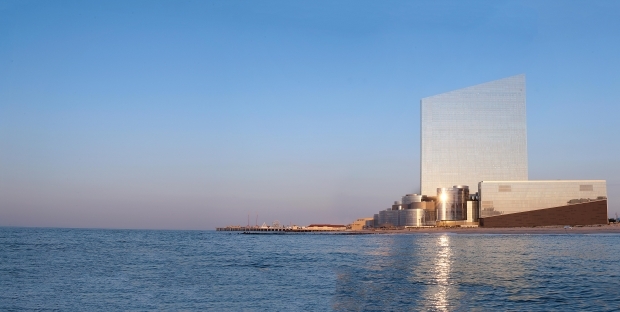 Revel looks pretty epic – the exterior is “reflective” of the surrounding environment – and it is the northern-most property on the boardwalk, right near the channel that cuts between Atlantic City and Brigantine. Stay tuned for the full scoop. The Revel as seen from Brigantine. Photo courtesy of Revel Resorts.